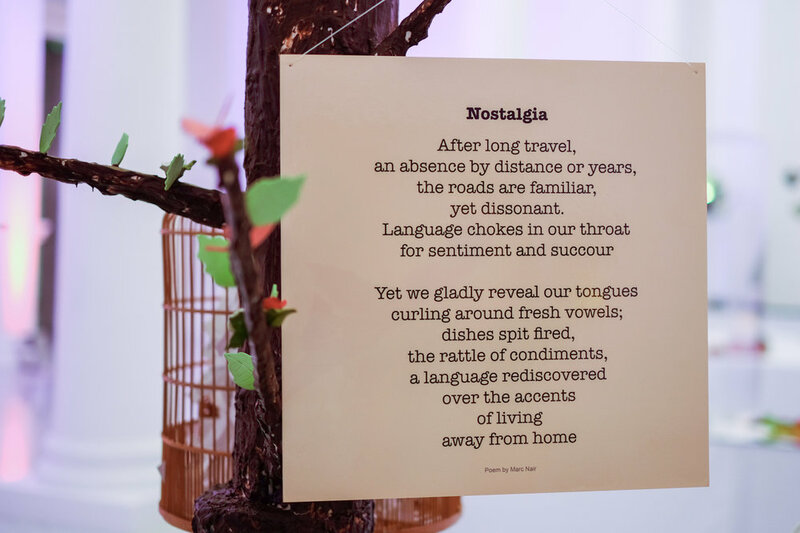 Above: Chocolate tree with ‘Birdcage Totem’ by Nicola Anthony, and ‘Nostalgia’ poem by Marc Nair. Photo by Marc Nair. Nicola Anthony's artwork "Birdcage Totem" will take part in Art Supper, an Edible Art Movement event in collaboration with Art Stage Singapore 2015. On Wednesday evening, (Edible Art Movement) had the pleasure of being invited to take part in a wonderful collaboration of food and art in celebration of Singapore Art Week 2015. 500 VIP guests were invited to experience the work of 8 EAM artists in collaboration with top local Chef Matthew Mok from the Rabbit Stash. The event consisted of 4 themed tables (Nostalgia, Soil, Exotic, Ocean) which combined food and art signifying the theme and ideas that were uniquely Singapore. Hosted by Singapore Tourism Board, this was the official 'after Vernissage' celebration of Art Stage Singapore during Art Week 2015.